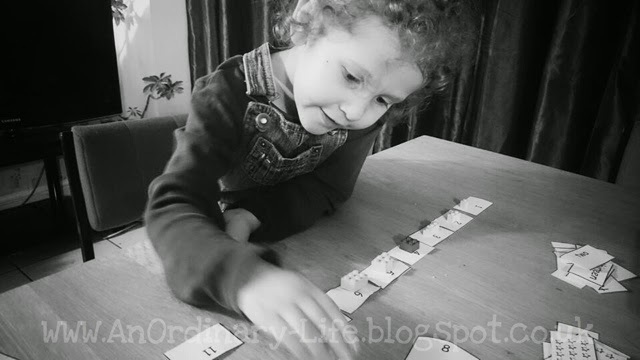 I have been thinking of more ways I can help Harmonie with her learning. She gets bored so easily and drifts off into a land of daydreams and story telling. I don't want her to think that is wrong but I do want to help her to learn more maths and to read. She's very much a kinaesthetic learner so I got thinking. I printed out this sheet of numbers for a mix and match game. I cut out the digits only. I found our Lego box and got out a handful of bricks, 1 studded ones, 2 studded ones, 4, 6 and 8 studded ones. I placed them on the table. I mixed up the digits on the table in front of her and asked her to find a number. I started with 1 (ready to work through to 15). When she found the right number I helped her to find the right amount of Lego studs to match the card. So a 1 studded piece for the number 1. Then I repeated STEP FOUR and STEP FIVE until with got to 15. She counted to 15 by the end of this activity and she was smiling. I was so pleased with how it went I added it here to my maths resources. I hope it will be helpful to others. Yesterday, we started with just the digits. I did help her if she got stuck, frustration does not help with learning new things. I played it like a game to keep it fun. You can use this game to learn the number words too.